Brandon Schwartz, an avalanche forecaster with the Sierra Avalanche Center, digs a snow pit to analyze the snowpack. The center recently benefitted from the raffle sales at the annual Beacons and Beers event at Alibi Ale Works. With the mountains around the Tahoe region still awaiting winter’s first storms, many of the area’s diehard skiers and snowboarders gathered at Alibi Ale Works in Truckee to hear from experts on using search and rescue gear in the backcountry. Roughly 150 people were on hand for the annual Beacons and Beers, presented by Tahoe Mountain Sports, on Wednesday evening, as representatives from Black Diamond, Mammut and ORTOVOX gave presentations on the latest beacons, probes and avalanche rescue techniques. 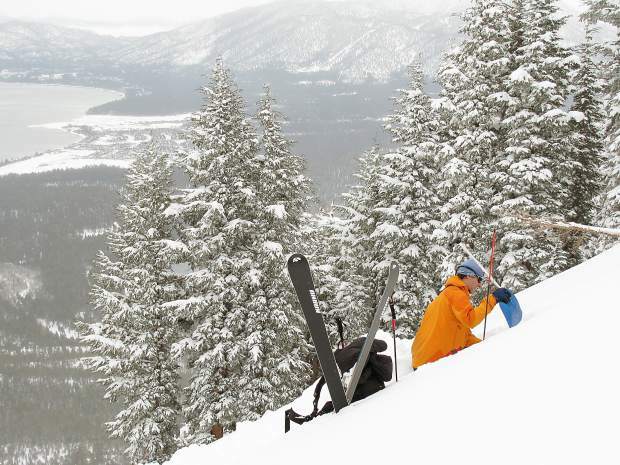 “We want to remind people that traveling in the backcountry is dangerous, and we want to make sure that people have the skills to be safe,” said Dave Polivy, owner of Tahoe Mountain Sports. The evening centered on the importance of having proper equipment and knowing how to use it before heading into the backcountry. For those just getting into backcountry riding, Polivy said taking an American Institute for Avalanche Research and Education Level 1 Class is essential. The course is so important, Jared Rodriguez, sales representative for ORTOVOX, said he wouldn’t hit the backcountry with anyone who hadn’t taken it. “I would not personally ski with somebody who has not been through a class, because you are basically putting your life in your partner’s hands,” said Rodriguez, who added that those who haven’t taken a class in a while should consider retaking one. “I took the AIARE Level 1 class about 15 years ago, and then I took it again about three years ago. That class has evolved. Rodriguez also stressed the importance of having the appropriate equipment. Having a shovel, probe, and beacon lowers the average rescue time following an avalanche to 11 minutes, and there is a 92 percent chance of survival if someone who has been buried by an avalanche is found within 15 minutes. For those who are more experienced in the backcountry, Rodriguez said that becoming complacent and over confident are often the biggest mistakes skiers make. The evening also included demonstrations on how to use beacons and probes, and also a raffle benefiting Sierra Avalanche Center.